A wallaby is any of about thirty species of macropod (Family Macropodidae). It is an informal designation generally used for any macropod that is smaller than a kangaroo or wallaroo that has not been given some other name. Very small forest-dwelling wallabies are known as pademelons (genus Thylogale) and dorcopsises (genera Dorcopsis and Dorcopsulus). The name wallaby comes from the Eora Aboriginal tribe who were the original inhabitants of the Sydney area. 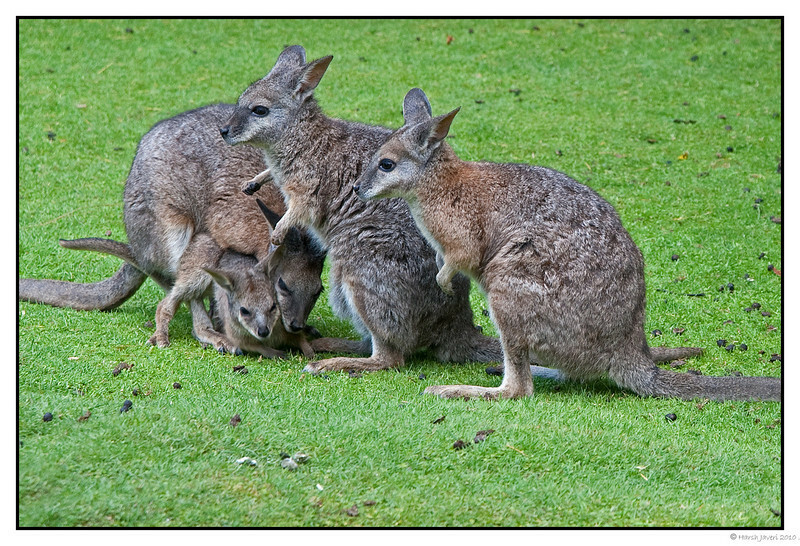 Young wallabies are known as "joeys", like many other marsupials. Am going out of town for a few days and will not be commenting on pictures till I return. Take care! Cheers!! Not something we normally see - great shot. Fantastic capture of so many of them!